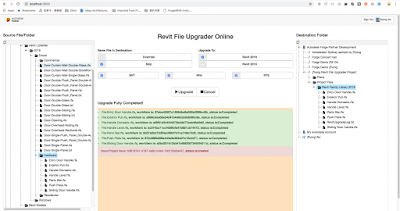 We used to have a Revit Desktop plugin to upgrade local Revit project/family/template to the latest version, but since we are now moving to the cloud, especially BIM360 is used more and more widely, a tool which can upgrade cloud based Revit project/family/template without a Revit desktop plugin would be very helpful, that's the Design Automation for Revit API does, and this sample does. 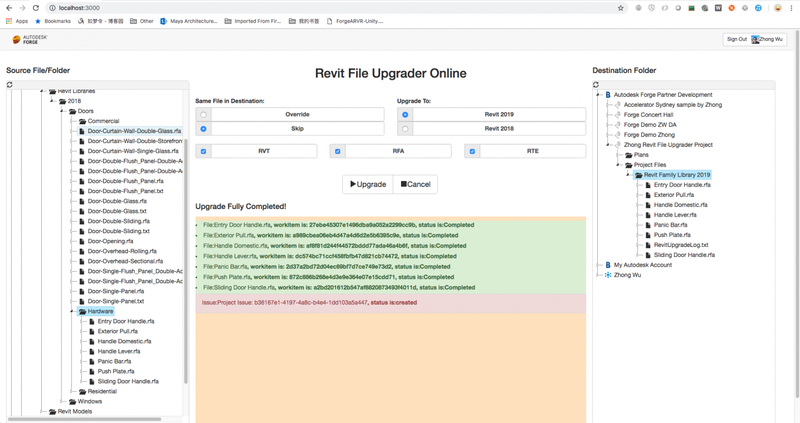 Select Revit file in BIM360 Hub from Source File/Folder, Right Click and select upgrade to Revit 2019. It will create a new version of this file after successfully upgraded. Select Source Folder and Destination Folder, then click Upgrade, it will upgrade all the files under the folder to destinated folder. For more details, please check the source code on Github/Autodesk-Forge.